With everything done for the day in Lucena with a sidetrip to Silangang Nayon in Pgbilao, Tutubi didn't eat again at Panciteria Granja for chami nor at nearby Buddy's for their Pancit Lucban. He had another pasalubong and local delicacy in mind to search in Lucena City. As a child, he used to eat tikoy in Paete as well as those made in nearby towns of Laguna and Quezon. Zabala's tikoy was one of his favorites due to it's no-cooking required tikoy recipe, unlike Chinese tikoy during Chinese New Year that require dipping in egg batter and deep-fried, Zabala's Tikoy can be eaten out of the packaging. Zabala's tikoy recipe is tasty and not too sweet, with slightly yellow color and sticky so you sometimes need an oil-dipped knife to cut it. All ingredients, mostly glutinous rice, mixed in a bowl and then steamed on trays stacked on one another. Too bad, all tikoy for the day were already cooked and Tutubi wasn't able to take pictures of tikoy being made for "documentation purposes." Although business is brisk during the Christmas season for decades, the business has seen the best of days due to competition and changing people's habits. 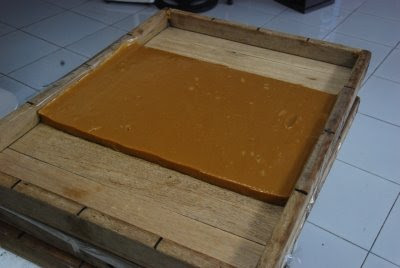 half-tray of tikoy about an inch thick. these are sliced to the desired sizes then wrapped in colored plastic wrappers similar to those used for sweet yema. A chinese friend of Tutubi mentioned to him once that tikoy came from the Chinese word for sweet cake but Filipinos misheard the Chinese name and now calls the sweet pudding tikoy. 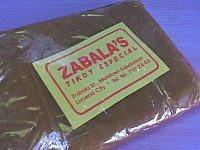 Tutubi was able to find Zabala's tikoy in Lucena through the help of his sister who used to live there as guest of the transient house, also at Zabala's tikoy factory. Zabala's is inside Mark Town Subdivision and just a few meters from the highway where SM City Lucena is located. From SM Lucena, drive towards Lucena city center, look for a huge store with Quality Ceramics sign about 500 meters from SM and turn there. 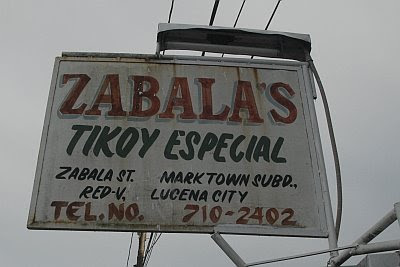 Zabala's Tikoy Especial is about 100 meters from the corner. If you're commuting, a tricycle ride from SM will do. Hmmm, this post is making me feel hungry again. ganyan pala gawin ang tikoy.. sa wood nilalagay.. It's been years since my last trip to Lucena! So, that's how tikoy is made. haven't had than in years too! May craving tuloy ako. This how-to feature is great! Never knew that this is how tikoy is created. Will check out more posts here. Thanks! I miss the Philippines! magkano ngayon ang tikoy per box? thanks and more power sa zabala tikoy.